Scroll down for a free printable Map Of Minnesota. The above US map shows the location of the state of Minnesota in relation to other US states. 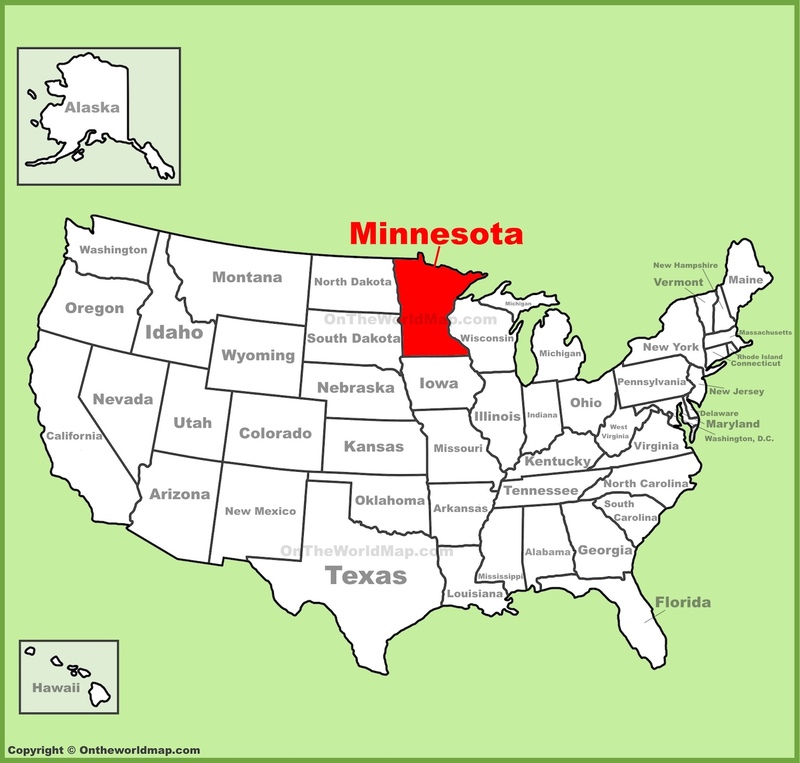 On May 11th of 1858, Minnesota became the 32nd of 50 states admitted to the Union. Scroll down to find out fascinating facts about the state of Minnesota. Also see a map of Minnesota cities, a Minnesota map of counties, and related links to other free printable items. Nobel Prize winning singer and songwriter Bob Dylan hails from Hibbing, Minnesota. Hibbing is also where the Greyhound Bus company started, and is home to the Greyhound Bus Museum. In 1912, The Better Business Bureau was founded in Minneapolis. The state of Minnesota has better health care than any other US state. The Mall Of America in Bloomington was, for a time, America's largest indoor shopping mall. It's about four miles long and has its own amusement park and public transportation system, not to mention more than 500 stores. Minnesota stocks it's lakes and rivers with more than 250 million fish every year. In total, the state of Minnesota has more than 13 million acres of surface water. Minnesota produces, on average, more than a billion bushels of corn every year, with each bushel weighing more than 50 pounds. More NHL players come from Minnesota than from any other US state. Minnesota's nickname is "The Land Of 10,000 Lakes," although Minnesota actually has 11,842 lakes. Above: An enhanced google Map Of Minnesota, showing larger cities, major roadways, and adjoining states. 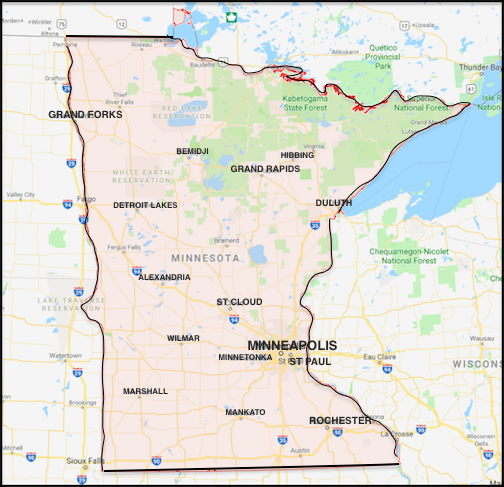 Above: A map of Minnesota counties and the state's 7 geographical regions.